of undead. In a way, zombies have become the ultimate MacGuffin, a plot device that stirs our heroes to action and soul-searching. The script shows flashes of underplayed brilliance. Barsotti has a gift for capturing snatches of ordinary conversation and inserting them into bizarre situations for good effect. Unfortunately, he fails to fully develop his underlying hypothesis and the play’s punchline gets muddled. We are left to conjecture about the message we should take to heart. Love eats us up? Love is finite? Zombies are a many splendored thing? I’m still confused. a bad acid trip. I will see him in my dreams tonight, and I don’t think I will be happy about it. But DiLoreto isn’t as successful in creating the needed tension between the two survivors to make us invest in the outcome. 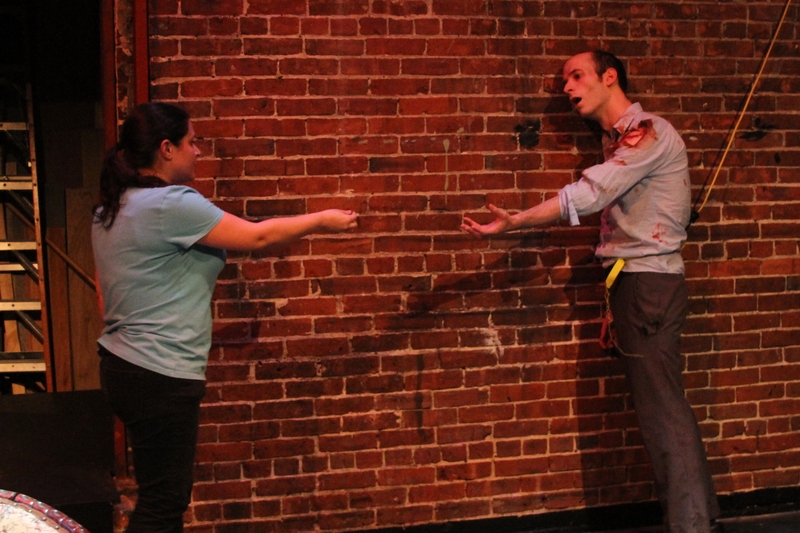 Actors Tim Fairley and Audrey Lynn Sylvia (Gary and Karen) both have good moments, but they don’t seem to be on the same page with one another, which negates their characters’ connection throughout the play and especially during what could be a chilling climax. The actors are not helped by DiLoreto’s blocking, which asks us to believe that Gary would be oblivious to a physical secret Karen is harboring, a secret so important for survival and so telegraphed that any child would notice. Still, horror on stage rarely succeeds, and this production does create a real edge- of-your-seat tension. While The Revenants does not paint a complete picture, it fills in enough to give theatergoers a delicious case of the willies. This entry was posted in Uncategorized and tagged Audrey Lynn Sylvia, Horror, MacGuffin, Mikey DiLoreto, Scott T. Barsotti, The Revenants, the Walking Dead, Tim Fairley, William Schuller, Zombie by craigidlebrook. Bookmark the permalink.